Agile project management: there’s no escaping it in the workplace these days. “Put it in the backlog.” “We’ll work on it during the next sprint.” “Talk to the Scrum Master.” The buzzwords of Agile project management are ubiquitous, and love it or hate it, you’ll benefit from being familiar with its principles. + What is Agile project management? + Why use Agile project management? + Who can benefit from working with Agile project management? + Tell me more. More! In 2001, 17 software developers got together at the Snowbird resort in Utah to ski, drink hot cocoa, and chat about unshackling themselves from the heavy restraints of traditional software development. Jeff Sutherland—now considered the godfather of Agile project management—and his buddies together penned the now legendary Manifesto for Agile Software Development. 1. marked by the ready ability to move with quick and easy grace. 2. having a quick, resourceful, and adaptable character. Traditional project management methodologies such as Waterfall, PMI’s PMBOK, and PRINCE2 are all rigid and highly controlled. They outline distinct stages for project planning from start to finish, and assume that you have all the requirements and information you need upfront. Agile rejects these traditional project management methodologies as cumbersome, restrictive, and unsuitable for the new era of speed. Teams need to stay fast and flexible, even as they grow. Why use Agile project management? These results are higher than what organizations with low agility achieve. The same research shows that agile organizations grow revenue 37% faster and earn 30% higher profits than non-agile companies. Agile project management is popular because it’s well suited for what happens to people in real life. Business move quickly, things change all the time, and teams need to be able to adapt to these changes. Retrospection—the 12th principle outlined in the Manifesto—helps teams understand what worked, what didn’t, and to adjust their workflow accordingly. This empowers teams to constantly improve. Here’s the thing: Agile isn’t considered a methodology, but is rather an overarching philosophy or a belief system. There are many different methodologies with which you can actually implement Agile’s principles. Think of it this way: Christianity is a large umbrella term that reflects a general set of beliefs and principles. There are many different ways to actually practice this set of beliefs on a daily basis: Catholicism, Protestantism, Eastern Orthodox, and so on. All these denominations share a lot of core similarities, but they’re also different in their interpretations and practice. Agile and its methodologies are similar, except that they’re not a religion, at least for most people :). Some methodologies with which you can implement the Agile philosophy include kanban, extreme programming (XP), crystal, and dynamic systems development method (DSDM). One of the most popular Agile methodologies, and the one we’ll explore here, is Scrum. The same guys who wrote the Agile Manifesto are the ones who collaborated together to invent Scrum in the early 2000s. You can now take courses to become Scrum-certified through the Scrum Alliance or Scrum.org, but you certainly don’t have to. Almost all of our teams here at monday.com use some interpretation of Scrum to manage their day-to-day work. Weird name aside, we think Scrum is an easy, intuitive, and fun way to focus on what you need to get done from one week to the next. Think about your projects and goals. What specific tasks need to be completed to reach them? Don’t hold back. Get down to the dirty details, and try to break down tasks into their smallest parts. You get the point. Breaking down your tasks allows you to much more accurately estimate how long it will take you to complete each task. It also helps you identify dependencies and priorities—what’s most important? What needs to happen first? Our R&D team actually has a bunch of backlogs: features we plan for our product, nice things that would improve the platform (which we call “cheese”), bugs we need to fix… and they’re all listed and organized in separate boards. These boards create transparency, aligning everyone on the big picture and ensuring that everyone is working toward the same goal. 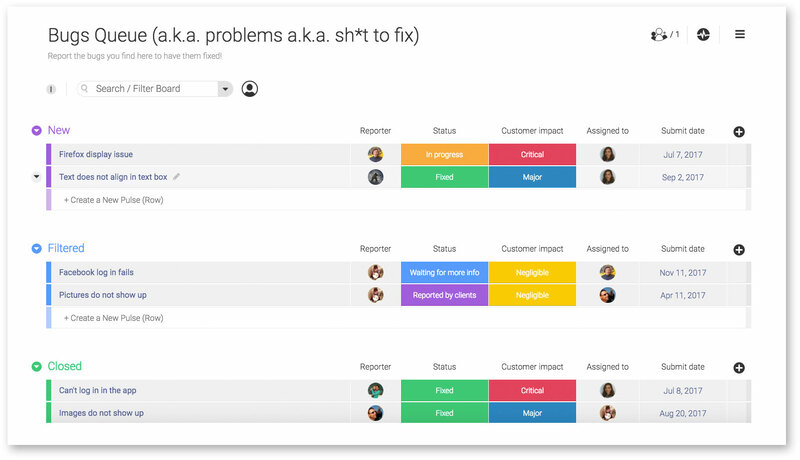 Team members can add new tasks to any backlog as new things come up and projects evolve. Agile project management values working by time: what exactly can you and your team achieve in a specified period of time? Scrum generally advocates working in two-week “sprints” or “iterations.” The idea of sprints is that it creates a sense of urgency. You’re singularly focused on achieving all you can before crossing that two-week finish line. On this board, you can (and should) map out and plan for multiple iterations. Be ambitious, but realistic, about what your team can achieve over the next two weeks. Go through your various backlogs, if you have more than one, to ensure you have all your bases covered. For example, you can decide that each sprint, you’re going to devote 30% of your time to fixing bugs, 50% to developing new features, and 20% to working on other improvements. The official Scrum term for these different areas of focus is “epic:” a chunk of work that has one common objective. In our example of redecorating your house, each room might be its own epic. It’s essentially a category that helps you keep track of how each smaller task fits together in the big picture. In monday, we like to use #tags to keep track of these epics. With one click on the #bug tag, for example, you can get a filtered review of all the bugs that have ever been reported or worked on. 4. 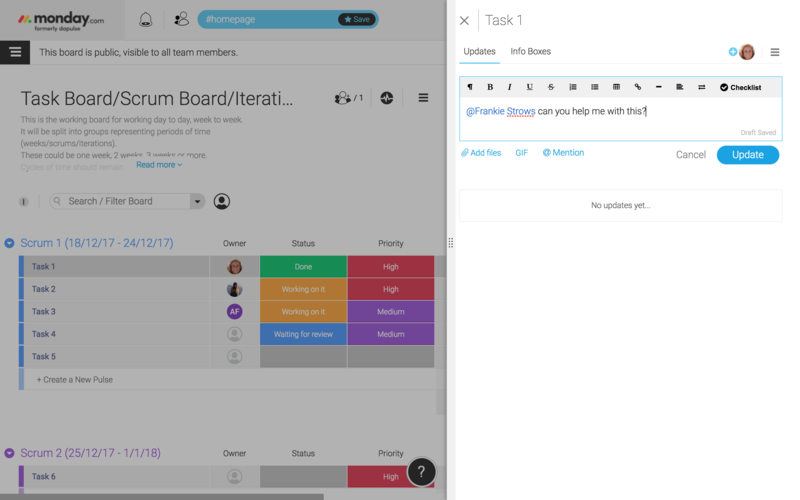 Assign each task in your sprint to someone on your team. Ownership motivates—that’s a guarantee. When a task has a person’s face next to it, it motivates the owner to take responsibility and see it through to the end. At the end of the iteration, it gives each individual recognition for their hard work. Different people also often rely on each other, so clearly seeing who’s working on what ensures smooth collaboration. 5. Prioritize the tasks in your upcoming sprint. Agile project management favors categorizing tasks according to four priorities: critical, high, medium, and low. Since plans can change and things might take longer than you estimate, there’s a good chance your team won’t be able to complete every single task in your upcoming sprint. Having the priority clearly noted helps you choose what to work on first. Make sure that the critical things get done, and push back the low priority things if necessary. 6. Estimate how long each task will take. When going through each task, try to think about the amount of work that needs to be done, the complexity of the work, and any risk or uncertainty you might encounter when working on the task. The classic Scrum methodology calls this overall effort a “story point,” but you can track it however you want: in days, hours, or whatever unit of time works best for you. This takes practice, and over time, you’ll get better at it. The more experience you gain estimating the amount of time and effort it takes to complete certain types of tasks, the more accurate your estimations will become. Using the monday.com numbers column, you can quickly calculate a sum of the total amount of time. 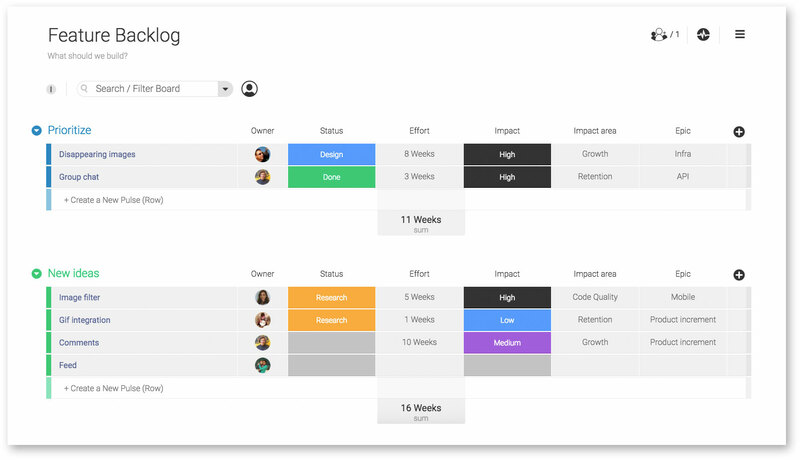 Add or remove work as necessary to gauge exactly what your team will achieve on the next two-week sprint. 7. Start your sprint! As you go, communicate with your team and update them on where things stand. Scrum respects that things change and unexpected circumstances can stop a task from reaching completion. If a task gets stuck or delayed, just update your status column to let everyone else on your team know where thing stand. 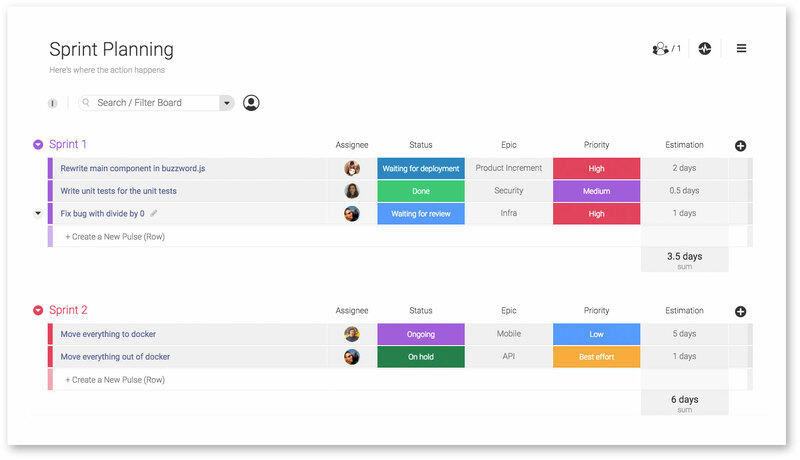 You can also mention a @teammate or @everyone on your team to notify them of what’s going on, and the updates in your board will store all the relevant documentation and information for everyone to see. Remember principle #6? Face-to-face communication is the best way for everyone to stay in sync. Schedule a short 10 to 15-minute scrum daily standup meeting at the beginning of every workday so that everyone on your team can provide a quick overview of what they worked on the day before and what they plan to work on that day. If anyone encountered a specific challenge or issue, this is a great opportunity to discuss it as a group and decide on the best course of action together. In monday.com, the name of the game is turning everything green—or in other words, marking your tasks as “done.” Once your sprint is over, sit as a team to celebrate what you all achieved, troubleshoot what went wrong, and plan how to tackle things in the next iteration. Mistakes are inevitable, and Agile values learning from these prior mistakes so that your team’s workflow can constantly evolve and improve. 10. Move your completed sprint to the bottom of your board. Start a new iteration at the top of the board. Rinse and repeat. 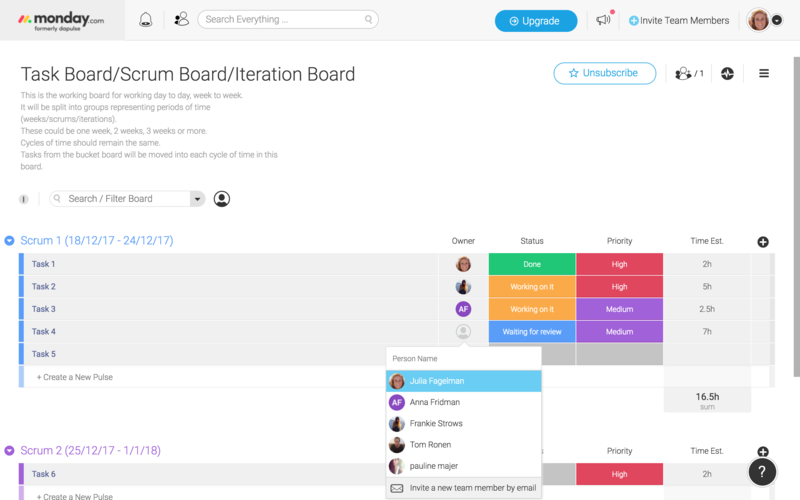 Storing all your iterations in one board allow you to keep a clear record of everything you’ve completed. Didn’t finish everything this sprint? Move it to the next one. And should a task from a previous sprint come back to life, you can just drag it back into your current sprint. In this video, our Customer Success Manager Anna (and her cute pup Simba) talk to our Head of R&D Daniel to see how our dev teams here at monday.com implement Agile project management with Scrum. Daniel walks you through our actual boards to show you how we plan ahead proactively for each iteration, squash bugs, and communicate and collaborate effectively. Who can benefit from working with Agile project management? While Agile project management was designed specifically around software development, anyone who works in a fast-paced and dynamic environment can benefit from working in a flexible and iterative manner. In fact, we’d go as far as to say that Agile is a life-changing way for anyone to work. Call it what you want—Scrum, Agile, getting sh*t done—it doesn’t really matter. Concentrating on what you can achieve during a specific one-week or two-week period gives everyone on your team achievable goals. It creates a sense of urgency, forcing you to make smart decisions to reach your goals. And it gives you the incredible feeling of accomplishment when you mark your tasks as “done” and see the whole week turn green. This boosts your motivation to start the next week fresh and tackle a new set of goals. There is so much to say about Agile project management and Scrum, and we’ve only touched the tip of the iceberg in this post. But hopefully even a few takeaways can help you and your team work smarter and get more done. 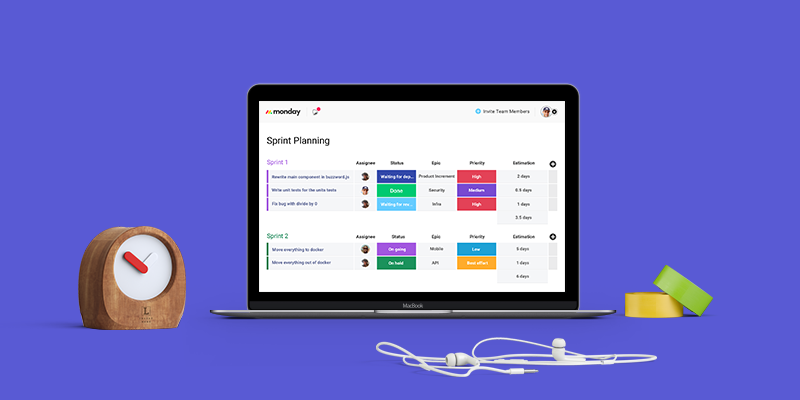 Plan your sprints, and collaborate as a team in one place + Get our agile project management templates boards for free. No credit card required. Take a deep dive into Waterfall, Kanban, PMBOK, and other top project management methodologies. Effective ways to implement Agile without any of the technical mumbo-jumbo. How our founders used Agile project management method to develop monday.com.